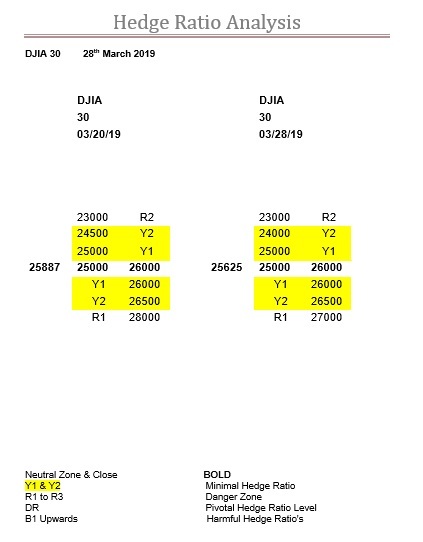 Well for the DJX it certainly is back to basics and we are seeing again a typical post triple type expiry. Or, to be more exact, with nothing happening. And, more to the point, by comparing the 20th to the 28th you can see how very little has changed. And the most important constant was evidently the top of the zone here, 26000, as, so far at least, it has caught the intraday high as well as the expiry high, of 26109. Worth noting, is on that day this index closed at 25887, and that two days later it went back for another bite, with the intraday high of 26009, before again capitulating. However, the most important aspect is that the zone is still a massive 1000-points wide. So, all well and good when it is all relatively peaceful and calm, but in the build up and into the rollover and expiry, if this doesn’t change, then volatility could come storming back with a vengeance. So, all you traders out there, start sharpening your knives. On top of which, and this also relies on the other US indices, that if it does gain traction and momentum, then that is a wickedly wide Y Ratio bandwidth, so it really could cut loose, in either direction or just whipsaw very violently.